Virginia Andrew, 89, of Melbourne, Florida, died Saturday, November 3, 2012. Barbara Ann Carroll, 73 of Melbourne, passed away Thursday, November 8, 2012. Barbara was born on June 21, 1939 in Queens, NY to the late Benjamin and Catherine (Justus) McKeag. She was a long time resident of Massapequa, NY before moving to Florida 14 years ago. Of all the things she loved to do, she enjoyed spending time with her family, camping and the beach the most. Barbara is survived by her beloved husband of 55 years, Edward, her children; Kathleen Walker, Maureen VonBargen both of Massapequa, NY, Michael Carroll of Alpharetta, GA, James Carroll of Huntington Beach, CA., 10 grandchildren and 1 great grandchild. She will be missed dearly. A visitation will take place on Monday, November 12th from 2:00 – 4:00 pm with a wake service to begin at 3:30 pm at Beach Funeral Homes, 4999 N. Wickham Road, Melbourne/Suntree. Funeral Mass will be celebrated on Tuesday, November 13, 2012 at 11:00 am at Ascension Catholic Church, Melbourne. In Lieu of flowers the family is requesting donations be made in Barbara’s memory to the Leukemia & Lymphoma Society by visiting their website at www.lls.org or to Wuesthoff Hospice House, 661 Eyster Blvd., Rockledge, FL. 32955 or the charity of your choice. Funeral services have been entrusted to the care of Beach Funeral Homes. Those wishing to send condolences may do so by visiting Barbara’s memory page at www.beachfuneralhome.com. Walter Albert DuLoft, Jr. "WALT", 85, of Melbourne, FL passed away on Monday, Nov. 5, 2012. He was born on Sept. 10, 1927 to Walter and Martha DuLoft in Chicago, IL. Walt was a long time resident of Fort Walton Beach, FL before moving to Melbourne. Walt served his country honorably in WWII; he was a twin 50’s gunner for the Navy and worked on the flight line for the Air Force. He loved boats, the water and would give help to anyone in need. Walt had a great love for his family, especially his great- grandchildren. Walt was predeceased by his wife, Adele and son, Bryan. He is survived by his daughter, Diana Panik and grandsons; Kevin R. Panik and John F. Panik, Jr.
A gathering will be held at Beach Funeral Homes – West, Melbourne/Suntree, on Tuesday, Nov. 13, 2012 from 8-9am with a service to be held at 8:30am. Burial will follow at Florida National Cemetery, Bushnell, FL will military honors at 12:30pm. Jeannie Tierney Glidden, 67, of Malabar, Florida was welcomed into the Kingdom of Heaven on Wednesday, October 31, 2012. Jeannie, a retired Southeast Airlines flight attendant, relocated to Brevard County in 1990 from Miami, FL. Always known for her huge heart willing to help any in need. Also, for her endearing care of animals, especially for stray cats and dogs. She was a devout fan of Dan Marino and Elvis Presley. Very loving and caring to all she knew. Deeply loved by all her friends and family. She will be greatly missed. Jeannie Glidden is survived by her brother John Tierney, as well as her nephew Joseph and niece Virginia Tierney. She was predeceased by her parents, Loretta and John, sister Eileen, brother Kevin and niece Genevieve Tierney. A memorial Mass will be celebrated on Wednesday November 14th, 2012 at 10am at the old St. Joseph Catholic Church on Miller St. in Palm Bay. Brownlie – Maxwell Funeral Home and Crematory is serving the family 723-2345 www.brownliemaxwell.com. A gorgeous, gregarious and gracious lady, Eileen Whelpley Gould, died peacefully with her family at her side on November 3, 2012. Eileen was born in Wilmington, NC and spent her youth between Wrightsville Beach, NC and Charleston, SC. 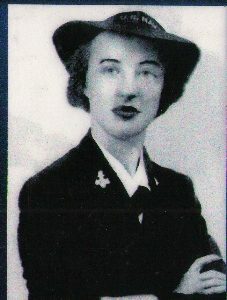 After attending Ashley Hall in Charleston, and enjoying life as a southern belle, she joined the Navy in 1942. Soon she was contacted by Wild Bill Donovan of the OSS and asked "Are you absolutely crazy?" And her affirmative answer assured her admission was solidified. Eileen parachuted into occupied France and completed covert operations behind enemy lines for the precursor to the CIA. After WWII, Eileen met a dashing young Marine fighter pilot, Charlie Gould, and lived through out the country but never more than a couple of hours from her beloved oceans, both Atlantic and Pacific. Eileen's early forties brought many happy changes; Charlie's retirement as a Colonel, their move to Washington DC where Charlie became a Deputy Director of NASA, and the birth of her only child, Amoret. Eileen was the ultimate DC hostess, and enthusiastic volunteer at her daughter's school, Maret. Eileen and Charlie moved to Indialantic in the 70's and she continued working for causes dear to her heart; beautification, the humane treatment of animals and a vigorous involvement with her fellow former intelligence officers in AFIO serving many volunteer positions. Eileen is survived by her daughter, Amoret, her son in law, Jim, two grandchildren, Spencer and Sloane all of Atlanta, and her nephew, Alan of Indian Harbour Beach. She was predeceased by her loving husband of 49 years, Charles, and her beloved brother, Donald. Eileen lived her life with gusto and will be remembered for her humorous stories, quick smile and generous heart. A service to celebrate Eileen's magnificent life will be announced at a later time. Memorial donations may be made to the Humane Society of South Brevard, a no kill shelter, located at 2600 Otter Creek Lane, Melbourne, FL 32940. Arrangements entrusted to Beach Funeral Home. Robert L. Hart, 86, a retired manufacturing engineer, died on November 3, 2012. Mr. Hart came to Satellite Beach from Hauppauge, Long Island, New York in 1975. He was a WWII Army veteran. Retiring after 40 years in engineering, he became a crossing guard for the Satellite Beach Police Department. He was also a member of the Cape Canaveral Hospital Auxiliary and the Melbourne Golf Association. Mr. Hart is survived by his best friend and loving wife of 60 years, Joan Hart. He is also survived by four children: Nancy (Charlie) Ragland of Cocoa Beach; Bob of PA; Tom (Debra) of Melbourne; and Julie (Rick) Brown of NC; as well as six grandchildren and three sisters. A gathering will be held at Beach Funeral Home East, 1689 S Patrick Drive, IHB, on Sunday, November 11th from 12 - 1 p.m., with services to begin at 1p.m. Memorial donations may be made to William Childs Hospice House in Robert's name. Anyone wishing to share a memory, send the family a message or place a memorial donation is asked to please visit Robert's guestbook at www.beachfuneralhome.com. Peter Miles, 51, of Rockledge, Florida died Sunday, November 4, 2012. Ernestine (Ernie) Pierce, 84, passed away Tuesday, November 06, 2012. She was born January 7, 1928 in Washington, D.C. but lived the majority of her life in Kendall, FL and Satellite Beach, FL. She was preceded in death by her husband of 47 years, Mr. James (Ray) Pierce. She is survived by her children James Pierce of Homestead, FL; Robert Pierce of Chicago, IL; and Deborah Harris of Melbourne, FL. She was the proud grandparent of J.R. Pierce of Plant City, FL; Tana Gerber of New York, NY; Chris and Kevin Harris of Melbourne, FL; and she was also blessed with 5 great-grandchildren. There will be a Memorial Visitation on November 24, 2012 at 1002 Cedar Brook Ct, Melbourne, FL between 12:00 and 2:00 p.m. Anyone wishing to share a memory, send the family a message or place a memorial donation is asked to please visit Ernie's guestbook at www.beachfuneralhome.com. Dorothy May Ubelhor Pontones, 85, passed away on November 7, 2012 in Melbourne, Florida. She was born May 13, 1927 in Evansville, IN, to the late August Ubelhor and Rose Lasher. She was a devoted and loving wife and mother, as well as a dedicated member of her church, Holy Name of Jesus Catholic Church. She was predeceased by her husband, of 61 years, Ramon. She is survived by four sons, Ronald of Tallahassee, Fl, David and James both of Melbourne, Fl, and Kevin of Orlando, Fl; four daughters, Sherron DuPont of Bonita Springs, Fl, Joan Brands of Palm Bay, Fl, Lynn Brashear and Lana Knapp both of Ft. Meyers, Fl; nineteen grandchildren and six great-grandchildren. 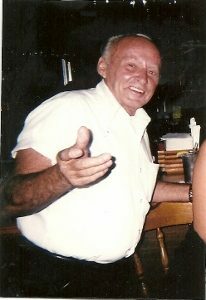 Visitation will be held at Beach Funeral Home in Indian Harbour Beach, from 6 to 8pm, Monday, November, 12, 2012. A mass of Christian Burial will be celebrated at 10:30am, Tuesday, November 13, 2012 at Holy Name of Jesus Catholic Church.